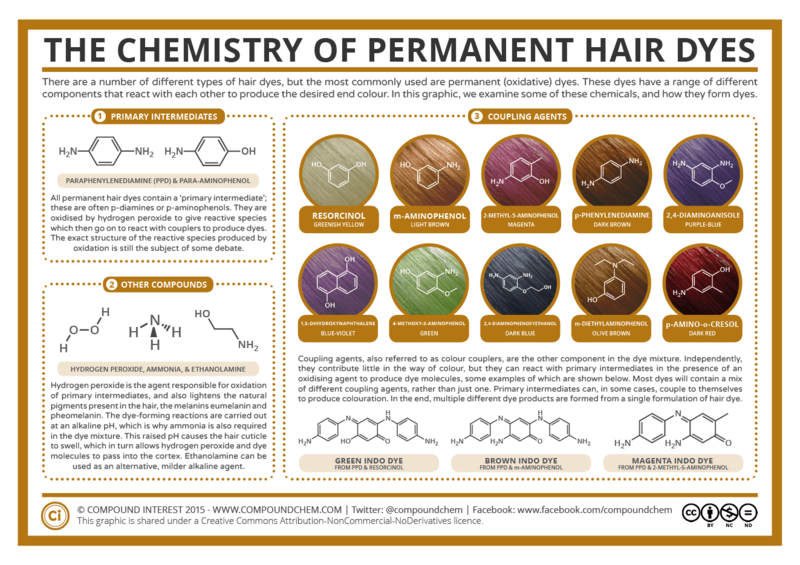 Before talking about the chemistry of hair dyes, it’s worth giving a mention to the molecules that cause our hair to be coloured in the first place. These are pigments called melanins, of which there are two types: eumelanin, and pheomelanin. Eumelanin causes shades ranging from brown to black, whilst pheomelanin gives colours in the range of blond to red. Darker hair, therefore, contains more eumelanin; generally, eumelanin is often the more abundant of the two types, though red hair contains primarily pheomelanin. Differing hair colours are merely the consequence of different balances in concentrations of these two pigments, and blond hair is often a result of a low concentration of melanin in general. There are a number of ways of dyeing hair, but we’ll be examining permanent (oxidative) dyes. 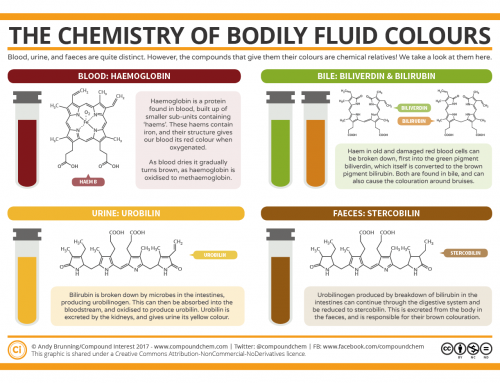 These dyes are based on an observation made over 150 years ago, that a chemical called paraphenylenediamine (PPD) produces brown shades when exposed to oxidising agents. Today, PPD is still one of the primary chemicals used in hair dyes as a primary intermediate, and, despite a number of online claims to the contrary, its use in these dyes is not banned in any country, though its levels are regulated. Its ubiquity, along with that of similar related compounds, is due to the fact that even in the 150 years since the discovery of its potential, we’ve still yet to find any better alternative for permanent hair dyeing. The PPD derivative 2,5-diaminotoluene or p-aminophenols are also sometimes used as alternative primary intermediates. 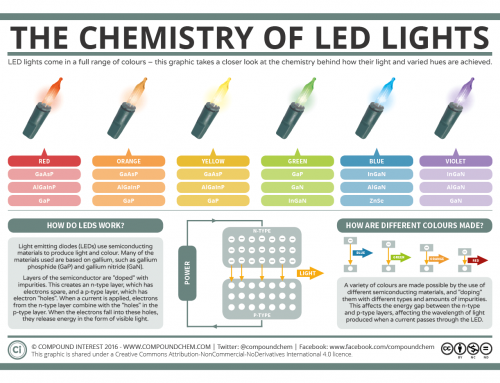 Primary intermediates only produce dye molecules when exposed to an oxidising agent. For this reason, hydrogen peroxide is included in almost all hair dyes. Hydrogen peroxide is a strong oxidising agent, and can oxidise the natural melanin pigments in hair, removing some of the conjugated double bonds that lead to their colour, and making their molecules colourless. More commonly, of course, we refer to this as bleaching the hair. 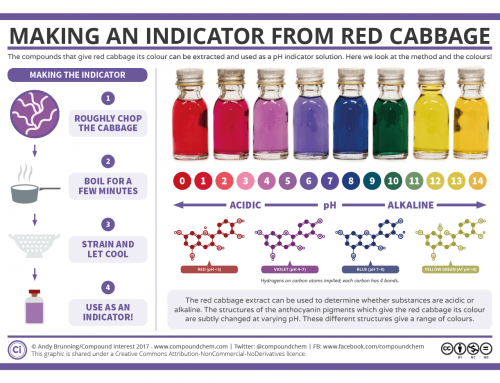 The peroxide also oxidises the primary intermediate molecules, producing a reactive species which can then go on an react and form the dye molecules. Of course, just being able to dye hair a dark brown colour wouldn’t be all that much use if dark brown isn’t the colour you’re after. For this reason, other compounds are also added into the hair dye mixture. 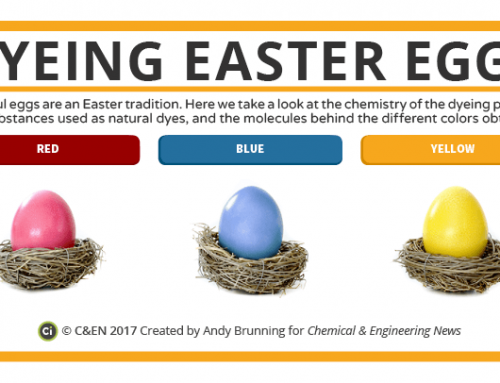 Known as couplers or coupling agents, whilst these compounds are not coloured themselves, they can react with molecules of the primary intermediates to produce a range of different coloured dyes. Hair dyes will typically include a range of different couplers in varying concentrations in order to achieve the exact shade required, so it’s rarely the case of it being one particular dye that causes the hair colour, but a mixture. The couplers are broadly grouped into three categories: blue couplers, red couplers, and green couplers. The reactions which produce the dyes are carried out at an alkaline pH, and in many cases this is provided by the presence of ammonia in the formulation. The ammonia causes the cuticles of the hair to swell, which then allows the dye molecules to pass into the hair and induce permanent colouring. This process can, however, damage the hair, particularly if you frequently dye it. For this reason, many companies have produced ammonia-free hair dyes, using substitutes such as ethanolamine. This is a milder agent, but also doesn’t cause the cuticle to swell as much as ammonia, meaning it has a few aesthetic drawbacks: it often washes out after a certain time period, unlike permanent colourings which merely grow out, and isn’t as effective at lightening hair. If you’re a regular user of permanent hair dyes, you might be wondering if there are any health concerns surrounding them. Some components in hair dyes have been categorised as ‘sensitisers’ – that is, that after an initial exposure, a repeat exposure could lead to an allergic reaction. This is the reason that some hair dyes recommend performing an allergy test 48 hours before applying the formulation to the hair, in order to guard against severe allergic reactions. Whilst life-endangering reactions are rare, they are not unheard of – only this month, a woman experienced potentially deadly anaphylaxis, and another woman died in 2011 after a similar reaction. Cancer risk from some of the chemicals in hair dyes has also been debated. Whilst studies have yet to establish a strong link, some studies looking at people who use hair dyes regularly at work discovered a correlation with a minor increase in rates of bladder cancer. As a result, they recommend that gloves are always used when applying the dyes. Studies on those who merely dye their own hair at home found no relation between development of bladder cancer and use of the dyes, though future studies may help to clarify whether this also poses a minor risk. If you do use hair dyes, gloves should be used, and the formulation shouldn’t be left on the hair for longer than the recommended time period. There’s a lot more to the complex chemistry of hair dyes – there’s an excellent review paper on the matter here. I’m also grateful to Rebecca Guenard for her help with the research for this graphic. You can read her in-depth discussion of the chemistry and associated risks of hair dyes for Mosaic Science here. 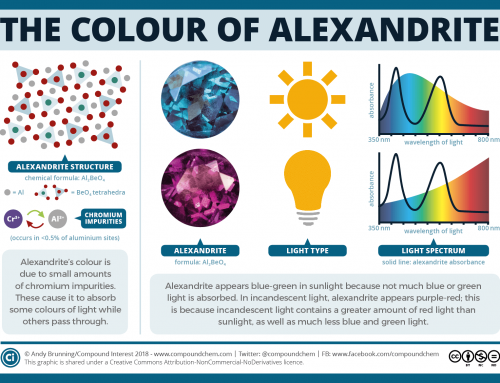 Note: the graphic originally showed m-phenylenediamine as a coupler that could produce a dye giving a blue-black colouration. Whilst this is correct, m-phenylenediamine has since been phased out for toxicological reasons. It’s been replaced in this updated version of the graphic.